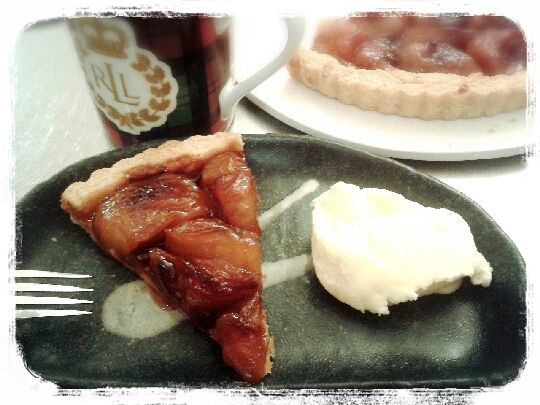 For years, my culinary white whale was the beloved Tarte Tatin. It’s especially regrettable to be unable to make a pie with such an interesting provenance – the Hotel Tatin and the hands of the Tatin sisters. I can imagine the Tatin sisters rolling in their grave as I fumbled and flubbled the recipe. For some reason, every time I tried to make this delicious pie, the caramel never really came together properly, the apples were always “meh”, and the crust was never quite good enough. Well, I am glad to report that after research and much trial (and much error…) I have a successful recipe, though it is a twist on the original. This is slightly more work than a traditional Tarte Tatin, and arguably lacks the original’s rustic appeal, but I find the final product prettier and more appealing. Also, once you have the crust down, you can use it for any number of French-style tartes. 7-8 Granny Smith Apples (NB: The apples will shrink, so use more than you think you’ll need. At worst, you can just gorge on the left-overs). Start by making your crust, which may take a little longer is easy once you get the hand of it. Mix together your flour and sugar evenly. Chop up your cold butter into pea-sized blocks, and then work the blocks into the flour-sugar mixture until you get a sandy consistency (this usually takes about 3-4 minutes). Mix together your egg and milk, and whisk the two together until the blended. Make a well in the sandy flour-sugar-butter (referenced above), pour in 2/3 of the the egg-milk mixture, and mix together the two with a fork. it will eventually get lumpy and you’ll have to roll up your sleeves and use your hands to gently kneed everything together just until you get a consistent dough. If the dough is still dry/crumbly, add some more of the egg-milk mixture. You’re shooting for something moist but not sticky. Shape your dough in a round, flat mound, wrap in plastic wrap, and then place in the fridge for 30 minutes. After 30 minutes, roll out your dough to about the thickness of two quarters/a one pound coin. Make sure that the dough sheet is larger than the diametre of the pie dish. If your dough is a little sticky, dust just enough flour on it to prevent it from sticking to the table. Lay the dough into the pie dish, tuck in the corners, and work the dough up the sides of the dish. Ideally, the dough should rise higher than the sides of the dish (by about 5mm) because the dough will shrink a bit during cooking. Poke holes with a fork in the dough at the bottom of the pie dish and then put the crust in a fridge for another 30 minutes. Turn on your oven and heat to 400F. After your crust has chilled for 30 minutes or so, take it out, put in some baking/pie weights in the middle, and bake blind for 10-12 minutes. Carefully remove the pie weights and continue to bake for another 10 or so minutes (i.e., until the crust is baked right through). Remove the crust from the oven, trim the sides to make them uniform (this is a great trick, and another reason to have high sides on your pie crust), and keep it at hand because its almost magic time. Ok…so the crust was a pain, but the filling is easy and satisfying. Core and peel your apples, and cut them into quarters. Do not cut the apples any smaller, or risk them dissolving away. Heat your frying pan to medium heat and melt the butter completely. Take the pan off the heat, mix in all of the sugar until dissolved (if you can’t get it 100% dissolved, don’t worry). Place the apples in the pan with the curved side down, turn up the heat to high or medium-high (i.e., as high as possible without burning the caramel), and then let your apples bubble and caramelize away. Keep an eye on the apples, however, to avoid having the caramel burn. I also like to cover the pan for the first 6-8 minutes to make sure the apples get cooked. Continue to cook until you have a nice, golden caramel covering your apples (about 12-14 minutes). They should be like amber jewels. Once you have removed the crust from the oven, and the apples are ready, delicately arrange the caramelized apples in the crust, and then carefully pour the caramelized syrup over the apples. Wait for the molten hot syrup to cool, bust out the vanilla ice cream, and eat your face off!